The Seattle rain is doing its October thing–pouring, puddling, splattering–and the cold gray world matches my mood. 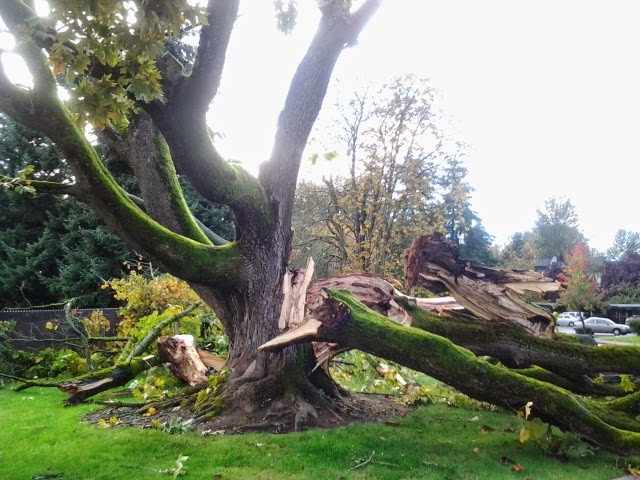 A windstorm blew through last night and fractured one of the oldest trees in town….an apt picture of the chasm created again by the world gone crazy with pain. Three hours north of me last Friday, a high school student opened fire at point blank range and killed his girlfriend, himself and critically injured his two cousins. On purpose. The only image I see when I close my eyes is one of teenagers moving slowly across an expanse of lawn, gingerly stepping to safety, hands raised in surrender. We give up trying to figure out the tell tale signs. We give up listening for clues. We give up wondering if we’re next. Today I want to give up, too. Give up happy. Give up joy. Some days the words fall apart and the joy is gone. Laura Boggess’ book ‘Playdates with God’ is more than a book about intentional fun and purposeful joy….it is also full of stories about finding God in the hard and humbling times as well. Each chapter speaks volumes. You can order “Playdates” here. Thank you for this, Jody. I love Laura, but I've been afraid of this book, afraid it was only about “intentional fun and purposeful joy.” Because, well, no thank you. Thanks for setting me straight. Bittersweet beauty in your words, Jody. Praise God we have the sweetness of his presence, comfort, and strength when the bitter times come! Such good truth on a sad day for Seattle and the world. He is there and He knows…. I wonder at the breaking of God's heart more than anything, when I think about the tragedy that occurred. We have no idea. Thanks for paving the way with YOUR words. This is so good. I so appreciate your words. I think many of us are restless and losing sleep and praying with intensity. God we feel so out of control sometimes, give us calm hearts, give a reason to keep pressing on and forward give us hope so we in turn can share hope. Jody, this is so tender and perhaps gives us the greatest truth to carry into those difficult places: we never go alone. Hugs to you dear one. Thank you for this. I had a little temper fit with God the other day. I was tired of asking Him for the same thing over and over, facing the same things over and over. Your post confirmed that honesty with Him is the best policy.